Kamenashi Kazuya, Anne, and Suzuki Fuku to sing the opening theme for "Yokai Ningen Bem"
As tokyohive previously reported, popular 1968 anime, "Yokai Ningen Bem" will get live-action drama adaptation starring KAT-TUN's Kamenashi Kazuya. Now, it's been announced that three main cast members Kamenashi (will play 'Bem'), Anne (will play 'Bera'), and Suzuki Fuku (will play 'Berro') will also sing the opening theme song. �They will cover "Yokai Ningen Bem" which was originally the opening theme song for the anime series. � The main theme song will be KAT-TUN's new song "BIRTH." Kamenashi commented, "Though it will have different type of voice and melody from the original, I think that adults might feel�some nostalgia. �It's a song where children could have new feelings." �Anne also said, "Since we all have different type of voices, I could not imagine how it would sound when our voices are mixed together, but it sounded great. �Kamenashi-kun's voice was something I have never heard before. �Anyway, it became a cool song." �Fuku-kun talked about the recording, "I was happy to be able to participate in the song. �Since Berro is a cheerful boy, I tried to say 'Berro~!' lively, and I also tried to sing with the feeling of 'I wanna be a human'." In this drama adaptation, it will show a friendship between "Yokai Ningen" Bem, Bera, Berro who are feared and �hated by humans, and a detective which will be played by Kitamura Kazuki. �Emoto Akira, Hori Chiemi, Hirota Reona, and Agata Morio will also make�appearance. 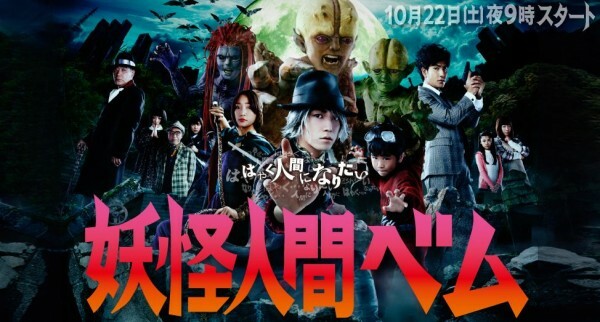 "Yokai Ningen Bem" will start airing on October 22nd on Nihon TV. THE BAWDIES release full PV for "Red Rocket Ship"